Who, me? Scared of dying? Geesh, I’m only 60 years old! But to my 4-year-old granddaughter, I must look like I’m ready to meet my maker at a moment’s notice! No, I’m not really scared of dying. At my age, I’m more curious about dying than frightened of it. Living in a nursing home. Living with Alzheimer’s Disease. Living with a stroke. Living without my eyesight or my hearing. Even living without my driver’s license! Those are the things that keep me awake at night. Then I think you’ll be as pleased as I was to learn about a publication just for people like us – people who have reached … well, a certain age. It’s called FOCUS ON HEALTHY AGING. And it’s published by the famous Icahn School of Medicine at Mount Sinai – the nation’s leading institution for the study of geriatrics and the diseases associated with aging. To get you acquainted with this remarkable publication, the folks at Mount Sinai have asked me to offer you a subscription with our iron-clad guarantee of satisfaction. Try it, read it and benefit from it. And if you’re not happy, let us know and we’ll refund your entire payment. It’s true, there are plenty of excellent health newsletters on the market right now. I subscribe to a few of them myself. And if you’ve read this far, I’m betting you do too. Reduce Your Fears About Aging! Discover the secrets to longer, independent living in Focus on Healthy Aging. Try it risk-free! Most of the health advice you see nowadays is intended for 25-to-45 year olds. But FOCUS is written just for people over 65. And that’s important. Because as your body changes with age, so does the kind of medical advice you need to live a long and healthy life. Did you know, for example, that there are several medical tests you should STOP getting as you get older? That thyroid disorders are often misdiagnosed – or even missed altogether – in seniors? That the recommended dosage on many OTC drugs is LOWER for older adults … but your ideal blood pressure may be HIGHER? Ever since one of its doctors coined the term “geriatrics” in 1909, the Icahn School of Medicine at Mount Sinai has been at the forefront of some of the most significant advances in senior health care. The world’s first cardiac stress test was performed at Mount Sinai. The first medical textbook on geriatric medicine was written there. Mount Sinai is a leader in the study and treatment of the diseases of aging: Parkinson’s, diabetes, and macular degeneration, to name a few. That’s why I believe there’s no more qualified institution in the country to publish this type of newsletter … and why I literally trust it with my life. Without confusing me with a lot of medical mumbo-jumbo – but without talking down to me either – FOCUS ON HEALTHY AGING turns the latest scientific research into workable strategies that can improve my health NOW. In recent issues, for example, I’ve learned about a popular OTC headache medicine that may help prevent Parkinson’s Disease. A delicious dessert topping that helps control high blood sugar. A new vitamin “cocktail” for macular degeneration. And a promising new drug for Alzheimer’s disease that used to be used in Russia as an antihistamine. Let’s face it. At our age, many of us are dealing with serious health issues – cancer, diabetes, heart disease. We have a choice. We can fret about it, or we can deal with it. And no publication does a better job of helping you deal with disease than FOCUS ON HEALTHY AGING. You’ll find out how to manage the side effects of chemotherapy. How to bounce back after a heart attack. How to catch glaucoma before it does irreversible damage to your vision. Where deadly skin cancers often hide undetected. And why your dentist is sometimes more important to your heart than your cardiologist! What I love about FOCUS ON HEALTHY AGING is that it puts my mind at ease. It helps me distinguish between the problems I can solve and the ones I can safely ignore, the issues that need a doctor’s attention and the ones I can treat on my own. Did you know, for example, that one of the earliest signs of cataracts is that your vision gets better? That there’s an early symptom of dementia which has nothing to do with memory? That you can determine your risk of stroke by taking your pulse? When it comes to nutrition and diet, FOCUS ON HEALTHY AGING tailors its advice specifically to older adults. And you’d be surprised at how often that advice differs from what you find in the popular media and on the Internet. Do you know the 3 most valuable vitamins for older adults? The one type of fish older folks should NEVER eat? The vitamin that helps “vaccinate” you against slip-and-fall accidents? The worst mineral supplement to take if you suffer from kidney disease? The miraculous combination of foods that may protect against Alzheimer’s? Before I started reading FOCUS ON HEALTHY AGING, I figured I just had to “live with it” when it came to chronic problems like joint pain and insomnia. But the doctors at Mount Sinai believe you shouldn’t have to live with poor health at any age. Because many of the conditions that used to be considered an “inevitable” part of aging can now be treated, prevented, even reversed. 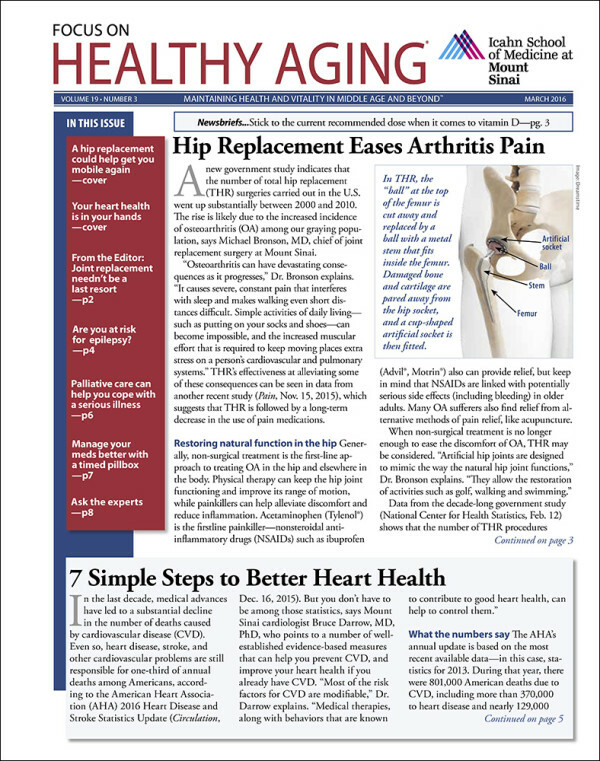 In the pages of FOCUS ON HEALTHY AGING, you’ll find out how to reduce the swelling around your feet and ankles (and how to know if it’s a sign of something more serious). How to get rid of a “dowager’s hump.” Finger exercises that restore strength and flexibility to arthritic hands. Even a new type of video game that has been shown to lift mild depression in seniors! Like me, you’re probably taking more prescription and OTC drugs today than you ever thought possible when you were younger. And the more drugs you take, the more you need to think about such things as side effects, interactions, and other risks. Fortunately, FOCUS ON HEALTHY AGING helps sort it all out. Is taking a daily aspirin, for example, really a good idea for seniors? Has your doctor prescribed one of the 21 drugs proven harmful to older adults? If you take an NSAID for joint pain, do you know which additional medicine you should take to protect your stomach? I actually take my copy of FOCUS ON HEALTHY AGING with me to the doctor’s office just to make sure I’m asking the right questions. Getting the right treatments. Avoiding unnecessary procedures. Understanding all my options and risks. In recent issues, for example, I’ve learned how to boost the effectiveness of a flu shot. Who really needs a cardiac stress test (and who doesn’t). Which new medical tests are a waste of money. When to make the switch from a GP to a Geriatrician. Even how to get moved up on the waiting list for an organ transplant! Sure, I want to live a long life. Who doesn’t? But what’s even more important to me is my quality of life in however many years I have left. I don’t want to be in a nursing home or some other kind of “facility.” I don’t want to be confined to a wheelchair. Unable to hear. Unable to see. Unable to think or remember. I want to make sure that I’m living in my own home. Driving my own car. Willing and able to take care of my own daily needs. I don’t want to be dependent on my children or grandchildren for help. I want to be a blessing in their lives and not a burden. That’s the main reason why I read FOCUS ON HEALTHY AGING. Because this remarkable publication gives me the information I need to maintain my independence – now and in the years ahead. That’s why I hope you’ll consider subscribing to FOCUS ON HEALTHY AGING, too. The folks at Mount Sinai have made it easy for you! Click here to place your order for FOCUS ON HEALTHY AGING. And you can feel confident that your subscription is risk-free for your entire term. After your first issue, second issue or eleventh. If FOCUS ON HEALTHY AGING ever fails to live up to my promises, call, write or email us and we’ll refund every penny. Easy enough? Easier than getting older, that’s for sure! Because even if you’re still in good health, you’re probably dealing with doctors, drugs, chronic conditions and minor disabilities to a degree that would’ve been hard to imagine twenty years ago. But one of the most important lessons to learn as we get older is that there’s no shame in seeking help — whether that help comes from a doctor, a close friend, or a monthly newsletter like FOCUS ON HEALTHY AGING. So please give FOCUS ON HEALTHY AGING a risk-free try! You’ll be glad you did. I guarantee it.